Gaby Moreno in a concert playing the guitar. 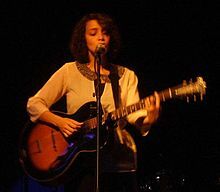 María Gabriela Moreno Bonilla (born 16 December 1981 in Guatemala City, Guatemala), professionally known as Gaby Moreno, is a Guatemalan singer-songwriter and guitarist. Her music ranges from blues, jazz, soul, to R&B. Moreno sings in English, Spanish, French and Portuguese. She became known to broader audiences in Latin America after recording a song with Ricardo Arjona in 2011, called "Fuiste Tú". In 2013, she recorded covers of the popular songs "Kiss of Fire" and "The Weed Smoker's Dream" with Hugh Laurie for his album, Didn't It Rain. On numerous occasions beginning in October 2016, she performed with Chris Thile on Live From Here giving her greater recognition among American listeners. María Gabriela Moreno Bonilla was born in Guatemala City on 16 December 1981. She has a Chihuahua-mix named Pepper, with whom she appeared in a PETA ad campaign, advocating for adoption rather than purchase of pets. Moreno is a vegan. KCRW's Ariana Morgernstern, producer of Morning Becomes Eclectic, featured Moreno in an October 2008 podcast and bestowed "Today's Top Tune" status on her song "Song of You." She said she was "caught by surprise with its organic and understated feel. She sings beautifully both in English and Spanish." In 2006, she won the Grand Prize in the John Lennon Songwriting Contest with her song "Escondidos," first in the Latin category, then overall. In July 2010 Moreno was nominated with her co-writer Vincent Jones for an Emmy in the category of "Outstanding Main Title Theme Music" for their theme song to NBC's "Parks and Recreation.". In 2010 Moreno was awarded "Favorite American Latino Indie Artist" at the American Latino Awards (run by American Latino TV). In August 2009 Moreno toured with established singer-songwriter Tracy Chapman. Later in November 2009, Moreno toured as direct support for Ani Difranco, on an east coast tour. Difranco invited Moreno back out on tour January/February 2010. In early 2011 Moreno and her band played their first headlining tour. They toured through the Netherlands and Belgium performing as part of the "World Sessions" tour. In addition, Moreno and her band opened as direct support for Nouvelle Vague for three shows in Germany. In late 2011 Gaby toured the U.S. East coast as direct support for The Milk Carton Kids. Spring 2012: Concerts together with Ricardo Arjona during his "Metamorfosis World Tour"
June 2012: Performance on "The Tonight Show with Jay Leno" to commemorate 50 years of Amnesty International, together with Kris Kristofferson and others. July 2012: Concerts in France, including Le Havre, Verdun and Paris. Toured with Hugh Laurie and The Copper Bottom Band through Europe. March 2014: She toured with Hugh Laurie and The Copper Bottom Band through South America, namely Argentina, Brazil and Mexico. February 28: The first day of the festival included performances of Óscar Isaac, Sara Watkins, and Ishto Juevez. March 1: Gaby Moreno gave her second concert of the festival. After her performance of the songs Ave que Migra and Blues de Mar, she introduced her guest Devorah Rahel with whom she played the song Y Tu Sombra. Her next guest was El Gordo, followed by Ishto Juevez. Gaby also played a song called Maldición, Bendición, which is part of her new production. The festival also included musical appearances of Alex Ferreira, Mexican singer Ximena Sariñana, and Natalia Lafurcade. A Grammy Award is an accolade by the Academy of Recording Arts & Sciences to recognize outstanding achievement in the music industry. ^ Keneth Cruz, "Gaby Moreno se une a Peta para proteger a los animales," PrenseLibre.com, 15 May 2014. ^ "Latin Grammy winner Gaby Moreno is a show-stopper in veggies!". PETA Latino. March 2017. ^ - NPR.org - Gaby Moreno "Song of You"
^ "Gaby Moreno y sus amigos regalaron magia" (in Spanish). Prensa Libre. Retrieved 24 September 2015. Wikimedia Commons has media related to Gaby Moreno. This page was last edited on 19 April 2019, at 06:44 (UTC).